In the 1960s the French diver Jacques Cousteau had a popular television series in which he sailed the oceans in his vessel Calypso. By filming the world beneath the sea he revealed its diversity and fragility to millions of people. 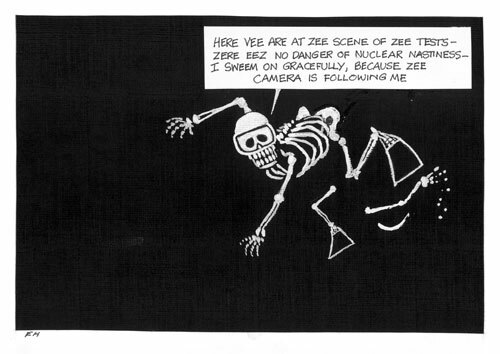 The topic of this 1986 cartoon is the French nuclear testing at Moruroa (Mururoa) Atoll, which only ended in 1996. Concerns about radioactive material contaminating the water led to calls for the French to stop testing. The campaign in the Pacific entered the public consciousness and helped focus conservation efforts on the marine environment. I saw this documentary and was seriously dismayed, having lost many friends and family members in Tahiti to thyroid and other cancers, allegedly directly related to nuclear exposures in Fr. Polynesia. All the good work Cousteau did before this was erased from my mind when I listened to him say what he said on this video. He lost all credibility after shooting that video. Even one as supposedly environmentally conscious as he, was able to be bought... very sad. Conversely, his son, Jean-Michel, seems to continue to produce enlightening, current and useful information.